Every day Fernandez took the mound for the Miami Marlins was Jose Day, and he was as likely to make batters miserable as he was to make everybody else smile. It was impossible for me to hold back tears when learning of Jose Fernandez’s death early Sunday morning. The 24-year-old Miami Marlins star, who died along with two others in a boating accident off Miami Beach, was one of the most fun-loving, joyful humans to ever play baseball. For a moment, forget the talent, the fastball or the dugout antics that made Fernandez the most smile-inducing player in the majors. Instead, think of why he always so happy. How could Fernandez be anything less than enthusiastic after arriving at stardom the way that he did? Multiple failed attempts to escape Cuba. A year in a Cuban prison. Saving his mother from drowning when they finally successfully fled their home. Jose Fernandez was living the American dream, risking everything for an opportunity to make it in this country. His story was less that of a pitcher and more that of a Disney prince. For South Florida, Fernandez was the blinding ray of sunshine amid a gloomy franchise that has long conditioned its fans for disappointment. Every fifth day was Jose Day, and it didn’t matter who the opponent was, the Marlins had a chance to win. Fernandez’s death—in a boating accident after all the times he tried to cross the water until he reached here—is cruelly tragic. It’s completely unfair that someone who took so much joy in what he did and brought so much enjoyment to others won’t be allowed to do those things anymore. 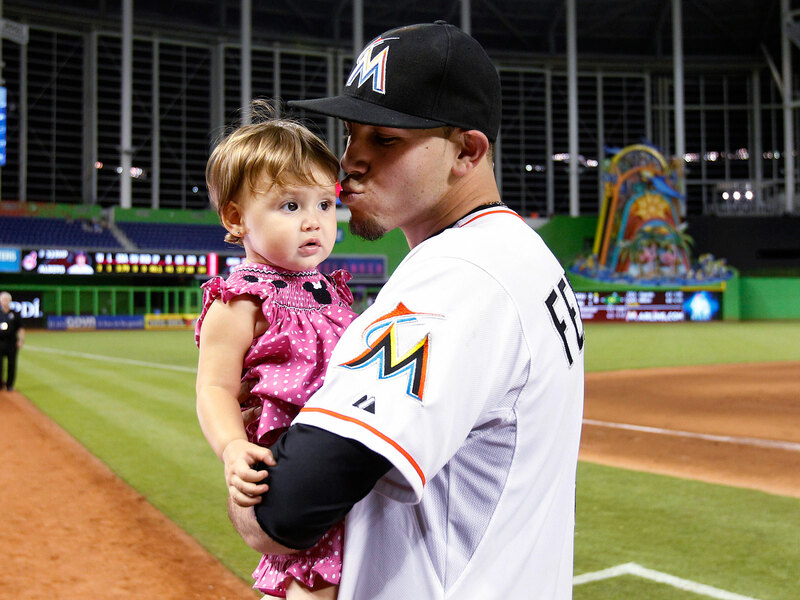 Jose Fernandez with his sister, Saleth Jimenez, after beating the Indians on Aug. 2, 2013. I was fortunate to have the briefest of professional brushes with Fernandez. In 2013, during his rookie season, I was an intern for the Miami Herald preparing to cover a Fernandez start on Aug. 2 against an Indians team riding an eight-game winning streak. One of the rules Clark Spencer, the paper's Marlins beat writer, had told me before I covered any games that summer was that the day’s starting pitcher was never to be bothered. Sure enough, starting pitchers were always ghosts in the clubhouse on their day to pitch, mostly keeping to themselves and building an intense focus for the game—at least when reporters were around. Fernandez was the complete opposite. Before his start that night, Fernandez wasn’t keeping to himself in the clubhouse. Instead, he was entertaining a young fan, hanging out with a kid and his dad until the first pitch. Fernandez, never one to brood at his locker with his headphones on, took the young fan all over the park, introducing him to players and staff before taking pictures with him on the field. In a matter of minutes, Fernandez went from high-fiving a child to making grown men look foolish. He moved the Indians down that night, finishing with 14 strikeouts while giving up just three hits. Cleveland's hitters looked flabbergasted at the plate, and the young fan who got to hang out with Fernandez before the game was probably having one of the best days of his life. "It's so much fun, every pitch for me," Fernandez said afterward. "The fans have just been incredible. The way you treat them with love and you get a lot of love back, that's just amazing." Only one small thing tainted that unforgettable performance for me and the 17,000-plus in attendance that night—Fernandez only pitched eight innings. We didn’t get a chance to see him finish what he started.